The Afghan National Army (ANA) falls under the control of the Ministry of Defense (MoD). At present (Oct 2012) there are about 195,000 members of the ANA. 1. Early 2000s. The first units of the present-day Afghan National Army were established in late 2002. The training classes were battalion-sized units, called Kandaks, and consisted of 500-900 men. The very first battalion (1st Battalion, Afghan National Guard) was trained by personnel from the British Army. Subsequent trainers were Special Forces detachments from 1st Battalion 3rd Special Forces Group followed by 5th Battalion 19th Special Forces. Once trained a Kandak would be deployed, advised and assisted by a Special Forces detachment from the CJSOTF-A, to different parts of the country. In the early 2000s training was conducted at the Kabul Military Training Center (KMTC). Conditions were harsh with little equipment for the recruits (uniforms, boots, weapons, etc.) and buildings with no heat. The pay was a paltry $30 a month and desertion rates were extremely high. 2013 - 2014: Transition to Afghans in the Lead for Security. 2013 saw the turning over of security to the Afghans. The ANSF are now in the lead with the Coalition in a supporting role. The vast majority of the fighting conducted in the 2013 fighting season was done by the ANSF. For the most part the ANSF has held its own - not losing too much real estate and keeping control of the major population centers and the important Highways 1 and 7. The ANSF has had trouble keeping control of many of the remote districts - notably Sangin district in Helmand province. 2015. This year was a very difficult one for the ANA. There were very few foreign combat forces left in Afghanistan. Most of the foreign military members were conducting "Train, Advise, and Assist" missions. There was some limited air support remaining but it was operating under very restrictive rules of engagement. While the Resolute Support Headquarters continued to say that the ANA was improving their capabilities in key areas such as intelligence, aviation, and sustainment; there was little proof of improved effectiveness on the battlefield. Much was made of the ANA's ability to conduct kandak, brigade and corps level military operations but this did not seem to translate into an effective counterinsurgency campaign. 2016. The Taliban and other insurgent groups did not take the usual 'winter break' in 2015-2016. Usually the operations tempo of the insurgents diminish as the mountain passes are filled with snow and many fighters move to Pakistan to their sanctuary areas. In the east, as a result of military operations by the Pakistan Army, some of these sanctuary areas were eliminated. Recent gains by the Taliban in the south (Helmand in particular) saw a lessened need to move to Pakistan during the winter months.The ANA was hard-pressed to fight off the Taliban in many areas of Afghanistan and had one of its busiest winter fighting seasons ever. Organization. The Afghan National Army has six corps headquarters and a Capital division (111th). 8. In addition to the infantry units there are military police, intelligence, route clearance (for IEDs), combat support, medical, aviation, engineer, and logistic units. Each ANA corps has on average 3 to 4 brigades to include a Corps Engineer Kandak, Military Intelligence Kandak, and other varied support units. In addition, some corps are now being augmented with a Mobile Strike Force (MSF). Each ANA brigade has 4-6 infantry kandaks, one Combat Support Kandak (CSK), and one Combat Service Support Kandak (CSSK). ANA General Staff. The Afghan National Army General Staff provides command and control over the Afghan ground and air forces. This includes six army corps, the 111th Capital Division located in the Kabul area, two Mobile Strike Force brigades, the National Engineer Brigade, detention operations, the Afghan Air Force, the Afghan National Army Special Operations Command, and the Special Mission Wing. ANA Ground Forces Command (GFC). This command was disestablished in early 2015. The Army's General Staff now has direct contact with and command and control over ANA corps commanders. The GFC was looked upon by many as a redundent and unnecessary bureaucratic layer within the ANA organization. ANA Corps. There are six Afghan National Army Corps. The 201st, 203rd, 205th, 207th, 209th, and 215th Corps. They are regional commands. Map of ANA Corps Boundaries (Dec 2015) 9. Afghan National Army Special Operations Command (ANASOC). The Afghan National Army Commandos and Afghan National Army Special Forces come under the command and control of ANASOC. As of spring 2015 there were ten Special Operations Kandaks. Afghan Army Air Corps. The Afghan Army Air Corps was at one time part of the ANA. The air component has now been redesignated as the Afghan Air Force or AAF. The Afghan Air Force was created in 2007 and currently (as of Fall 2013) has more than 6,000 personnel. It has a variety of aircraft to include helicopters and light fix-wing aircraft. ANA Tank Battalion. The Afghan National Army has one tank battalion - part of the 111th Division located in the Kabul area. The tank battalion has about 44 T-55 and T-62 tanks. At any given time about 20 tanks can actually work and as many as 6 have been used in operations in the Kabul area. There is a rudimentary logistics and maintenance program - Afghan style - that keeps the tanks running. This is basically canabilizing old tank hulks found throughout the country. The need for tanks in a counterinsurgency war is diminished - therefore the lack of support by the international community for this tank battalion. National Engineer Brigade. The Afghan Army's national level engineer brigade was established in recent years but has had a troubled start. See a report by the Special Inspector General for Afghanistan Reconstruction (SIGAR) about the Afghan National Engineer Brigade, SIGAR 16-15 Audit Report, January 2016. Constant Turnover of ANA. One of the big problems is the high constant turnover of members of the Afghan National Army. This is caused by two factors - the high desertion rate and low re-enlistment rate. 3. Not only does this drive costs up for recruitment efforts but it increases the cost of the training effort and decreases the effectiveness of the ANA. A third of the Army's force has to be recruited and trained every year. Currently the ANA is about 195,000 strong (as of October 2012). Desertions. There are many reasons cited for the high desertion rate and lack of second termers - including poor pay, corrupt officers, lack of equipment, sub-standard living conditions, terrible medical care, and the pressure of the Taliban and chance of dying in combat. 7. Leadership Problems. The Afghan National Army has a serious leadership problem. Senior officers are appointed with little regard to competence and are provided positions based on political factors. Most ANA officers are incompetent commanders. Capability Gaps. The Afghan National Defesne and Security Forces have several areas where they need improvement. These capability gaps include aerial fires, logisitics, maintenance, and operational planning. Training of the Afghan National Army (ANA). The NATO Training Mission - Afghanistan (NTM-A) - while it existed - was responsible for assisting the Ministry of Defense (MoD) with the training of the ANA. The NTM-A website at one time could be accessed here. The NTM-A mission statement read as follows "NTM-A suppports ISAF to enable accountable, Afghan led security not later than 31 December 2014". Hmmmmm. Let's just say there is still lots more work to be done. Officer cadet training is taking place at a training facility near Kabul informally called 'Sandhurst in the Sand'; the official name is the Afghan National Army Officer Academy or ANA-OA. Lack of Advisors and Mentors. The Afghan National Army performed better in the 2012-2013 period when the Security Force Assistance Advisory Teams (SFAATs) were attached to many of the ANA units from corps down to kandak level. As the advisor teams were pulled - first from the kandaks and later from the brigades - the ANA's performance began to slip. By late 2014 only four of the six ANA corps had full-time, permanent advisors. Except for Afghan SOF units - there were no advisors at brigage or kandak level. The absence of advisors saw an increase in corruption, growth of poor leadership practices, a decrease in operational planning, a decrease in OPTEMPO, and increasing problems with the logistical and supply systems. Political Interference. There is an abundance of nepotism and clientelism within the Ministry of Defense (MoD). Many high-ranking general officers are protected by senior political members of the Afghan government and other political patrons. There are many factions within the MoD and the ANA at large. These factions are from many different sectors of Afghan society: former muhahidin, former communists, corrupt officials, pro-Ghani, pro-Abdullah, pro-Karzai, ethnic groups, etc. Logistics of the ANA. One of the shortfalls of the ANA is its poor logistical system. Although it has made progress in it's ability to provide its units with material, supply, food, and ammunition it still has a long way. Glowing reports from ISAF and NTM-A about how the ANA logistical system is up and running should be tempered with regard to 'from the field' reporting from company, battalion, and brigade level Battle Space Owners (BSOs), Battle Space Integrators (BSIs), Security Force Assistance Advisory Teams (SFAATs), and advisors about how far behind the ANA logistics and maintenance programs are in being self-sufficient without coalition assistance. Literacy. One of the biggest challenges for the Afghan National Army is literacy. Currently, as of April 2014, less than 20 percent of the Afghans in the army are functionally literate. This means that more than 80 percent cannot read written orders or write reports. 4. While the Nato Training Mission - Afghanistan (NTM-A) had a literacy training program the results have been criticized by observers. 5. Artillery. The main gun for the ANA is the 122 mm D-30 howitzer. Usually 6-8 of these artillery pieces are found at the brigade level. Learn more about the Afghan 122-mm D-30. Afghan National Security Forces (ANSF): Training and Development. ISAF Media Backgrounder. February 2012. 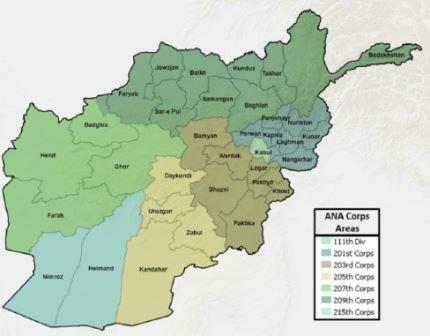 Provides info on current state of the ANSF as of February 2012. Adobe PDF file available here. Afghan National Army Special Forces. The ANASF are the elite of the ANA. Their training base is Camp Moorehead near Kabul. Recruitment for the ANASF is very selective and the training is difficult and comprehensive. Learn more about the ANASF. July 2014. ANA and Map Reading, DVIDS. A couple of videos on an 205th Corps ANA map reading class. View at this link and this link. An SF NCO from 7th SFGA describes the challenges of teaching map reading. November 3, 2015. "The Tale of Two Afghan Armies". Small Wars Journal. Lemar Alexander Farhad compares the Communist Afghan Army of the 1980s with the Afghan National Army of today. May 13, 2013. Afghan National Army Systems by Warfighting Function, 162D Infantry Brigade. May 1, 2015. "Funding Afghanistan's Army is a Long con That's Cost America $60 Billion", by Matthew Gault, War is Boring. There's no accountability, no oversight and no end in sight. April 29, 2015. "Phantom Troops, Taliban Fighting, and Wasted Money - It's Sprintime in Afghanistan", by Gary Owen, Vice News. January 17, 2013. "Which Way Did the Taliban Go?" The New York Times Magazine. An interesting report on how an ANA kandak operates - provides some info on the Military Advisor Team that advises the kandak. January 25, 2012. "Afghan army's night raiders ready to take control". Reuters. 2. Statement on Use of Afghan Nationals to Provide Security to U.S. Forces. Presented to the House Armed Services Committee of the U.S. House of Representatives, January 31, 2012. Accessed here on February 2, 2012. 3. See "Afghan Army's Turnover Threatens U.S. Strategy", The New York Times, October 15, 2012 accessed here for more on how the high turnover affects the ANA. 4. For more on ANA literacy read "Literate Afghans are key to sustainability", DVIDS, April 4, 2014 here. 5. For more on issues with the NTM-A literacy training program for the ANSF see blog posts from Afghan War News about literacy and the ANSF. 6. For more on the ANA tank battalion see "Afghan army's rusty tank relics still roll into battle", Stars and Stripes, July 20, 2014 at this link. 7. For more on desertions see "Desertions deplete Afghan forces, adding to security worries", Reuters, January 18, 2016. 8. At one time there was also, according to some sources, a 112th division also based in Kabul. 9. Map is from Enhancing Security and Stability in Afghanistan, DoD 1225 Report, December 2015, page 47.